Desk phones are the keystone of great business communications, and the MATRIX Sparsh VP330E IP Phone gives your employees the latest features available. Enhance the quality of response and efficiency for your hotel, hospital, or office building with this sleek and professional touch-screen phone. The Sparsh VP330E desk phone gives you all of the necessary functions of a traditional PBX phone, but adds the intuitive 4.3 inch color display. The perfect blend of superior voice quality and enhanced functionality. The MATRIX Sparsh VP330E IP desk phone features Enhanced Call Management. Dedicated one-touch feature keys and intuitive user interface provides quick access to full range of PBX call management features including Call Hold, Call Park, Call Transfer, Conference and Voicemail. Easy integration with the enterprise’s Corporate Directory (Global Directory) which allows you to easily locate and dial corporate contacts at one click. The Sparsh VP330E provides intuitive Presence status display and supports changing your Presence status which is viewable to other extension users. Each employee can also view the Presence Status of other remote users. The Busy Lamp Field (BLF) Indication allows staff to monitor the status of the extensions and trunks who are assigned DSS Soft keys, and also pickup ringing extensions/trunks using DSS Soft keys. An integrated Plug & Play feature enables you to power up the phone and immediately start using it. This feature also helps in the mass deployment of the phones within your organization, because it requires far less manual intervention than configuring each desk phone individually. Multiple Language Support offers operation in six different languages including: English, French, German, Spanish, Portuguese and Italian. 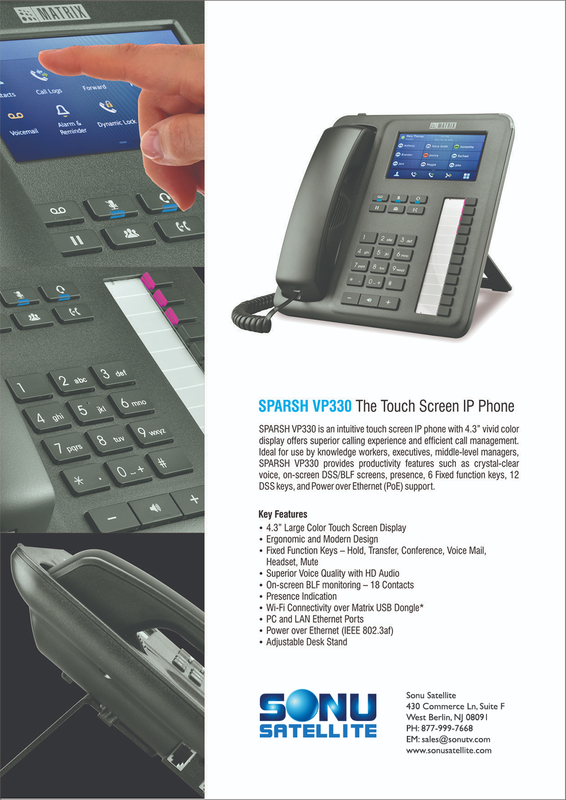 The Sparsh VP330E desk phone’s 4.3 inch Capacitive Touch Screen LCD (Liquid Crystal Display) delivers easy access to advanced features and a unique experience beyond traditional desk phones. The VP330E Supports adjustable brightness controls from the touch screen to suit your customized LCD requirement. 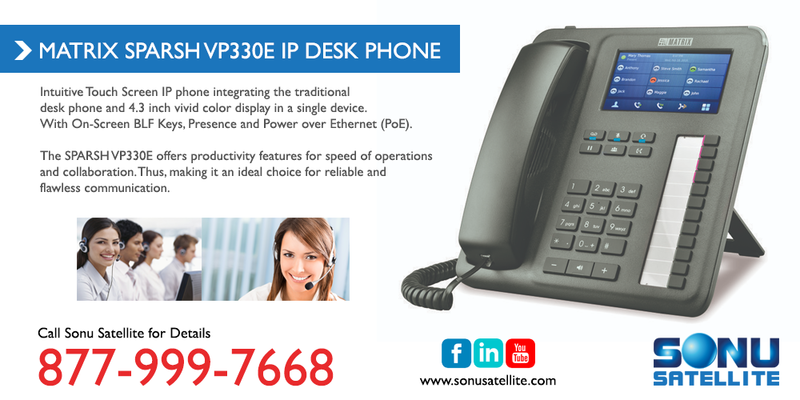 Sonu Satellite is a preferred vendor of MATRIX PBX Phone Systems for commercial properties, and is able to offer your business great pricing on the Sparsh VP330E IP Desk Phone and full PBX system with installation. Call us to speak with a live product specialist, and receive a free quote for your custom commercial phone system. You may also use the “Free Quote” button to fill out a short informational survey on your property, and our team will reach out to you with a free quote and additional details.